The Irish landscapes weren’t the only thing that the Argentinian group discovered during their trip to Ireland. A mysterious word appeared several times,in the program and from the organisers: ‘Comhaltas’. And nothing more important, specially for the musicians, than discover the existence of an organisation – whose complete name is Comhaltas Ceoltóirí Éireann, which means, association of Irish musicians dedicated exclusively to preservation and promotion of Irish Traditional Music and culture. It involves diverse persons, bands and agrupations all around the world, who organize ‘branches’ of the Central headquarters in Dublin. So, ‘it was in a conversation between JJ with Comhaltas people when the idea of inviting us to be part of this organisation, building the first ‘branch’ in Argentina and in South America. appeared. Only in the next days we began to realize the opportunity that this meant,’ on behave that Comhaltas not only organise traditional music festivals, but also works as an archive, helps to make contacts between musicians and has a lot of records and books edited. 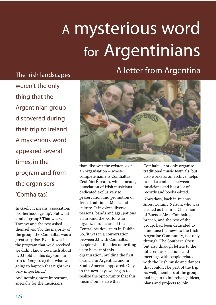 Nowadays, back in Buenos Aires, Tommy Nelson, who was elected as the first ‘Chairman’ of Buenos Aires Comhaltas branch, and the rest of the group, had been dedicated to announce the news to the Irish- Argentine Community, not only through ‘The Southern Cross’, but also through letters to the different associations and meetings with people related with the Irish music and dances that couldn’t be part of the trip. As well, members of the group had begun to interchange ideas, plans and projects to join efforts in the conservation and spreading of the Irish music and culture in the country.